Why are you applying for this team? My last three teams didn’t make the playoffs and it sure wasn’t my fault. So I figured I should try instead to get a team that is a surefire bet to win. We see you recently obtained the proper certification to coach at this level. What did you get from that clinic? Not much really. The lunches were okay. Desserts were gone by the time I got to the table but that’s because I’m a slow eater. I plan to write to the organizers about it. The wifi was a bit wonky, too. I had a real tough time checking emails. We could have used a few more breaks between topics. The one speaker I really liked was the guy from the AHL talking about scouting. His jokes were terrific. Plus juggling a pencil, a cell phone and an apple? Wow. Blew me away. With respect to skills vs. tactics in practice, which is a priority for this age group? Tactics of course. The kids get all that skill stuff in the summer and from Lace ’em Hockey Academy sessions throughout the season. I don’t see a reason to do more. Besides, I’m a poor teacher of passing and stuff. But I can teach forechecks and power play all day, so the priority will be on those. Keep in mind the kids are eight years old and have probably seen enough skills drills already. What does teach through progression mean to you? Breakouts first. Then zone entries. Then forechecks. Then backchecks. Might squeeze in neutral zone transition somewhere. The defensive zone play. But I’m flexible on that last one. I might do dee zone first and then breakouts. Depends on the last couple of games. 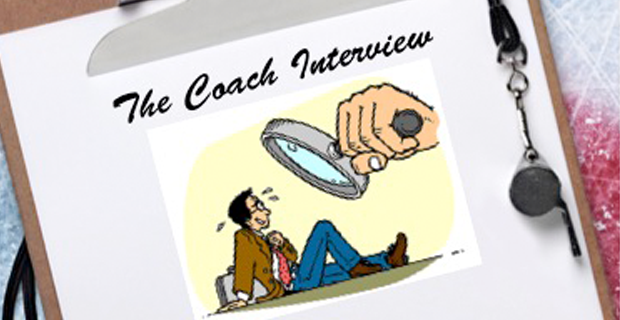 How do you use your assistant coaches? I have one for the defencemen and one for the forwards. I make the line changes for both but they’re in charge of giving the players feedback. We discuss before the game what things I want them to focus on. In practices, I run all the drills and the assistants set up the cones and pucks. But I handle the actual teaching. What’s your approach in communicating with parents? Simple. I don’t communicate with the parents. That’s the manager’s job. I talk to them at the first parents meeting and that’s it. Seems to me they all have ulterior motives for every comment or question so I’ve learned to stay clear. When I have a problem with a kid, I lay it out for the kid with my manager or an assistant present. Do you have long term goals for your coaching? First, win this year. Then look for a job in the pros, maybe the AHL or Europe for starters.